Jack Robert George Liddell was the youngest man to take part in the Dams Raid. He was born on 22 June 1924 in Weston-super-Mare, Somerset, the son of Robert and Winifred Liddell. His father died when Jack was a young boy and his mother remarried, so he had one sister and two further half-sisters. He was educated at Weston’s Walliscote Road School, and then took up work in the butchery trade. One day in May 1941, his sister, Sheila Fenwick, recalls him dressing in a suit, saying he was going to Bristol for the day. When he returned, he told his family that he had volunteered for the RAF. She was not surprised as, like so many other young men of his age, he was ‘flying mad’. He must have lied about his age, since he was still only 16. 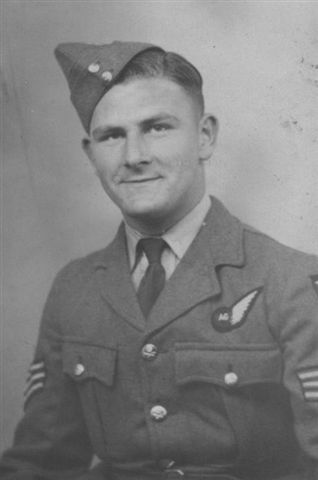 Liddell was selected for air gunner training, which he completed in May 1942. In September, he was posted to 61 Squadron as the rear gunner in a crew captained by Flt Sgt John Cockshott. 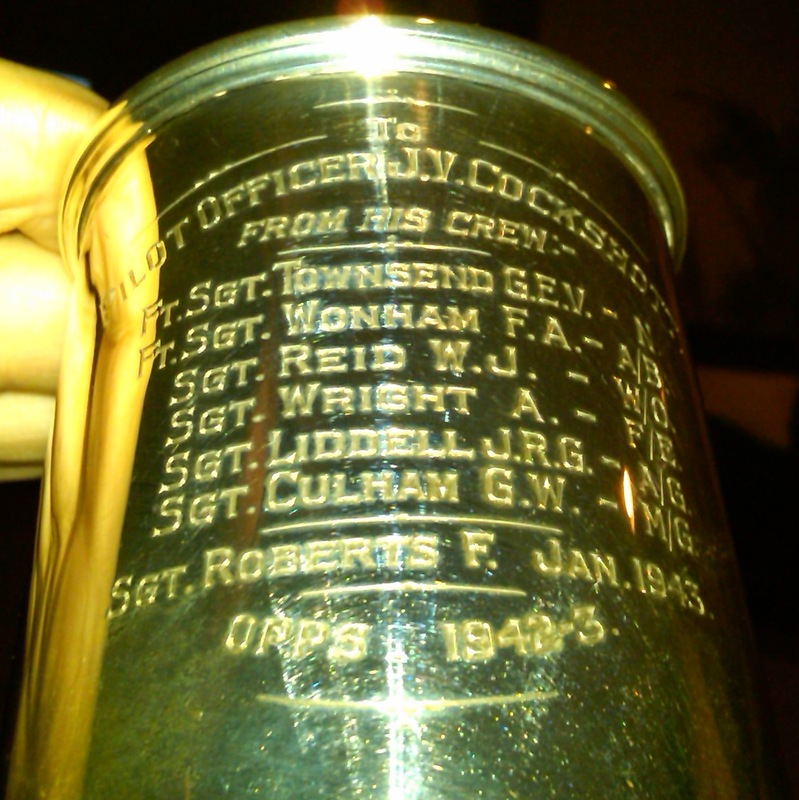 This crew completed a full tour of 30 operations together, and as a gesture of thanks to their pilot, they bought him a silver tankard. They weren’t able to get it engraved, but they gave him specific instructions to do this at the end of the war and the wording that should be used. Cockshott rose to the rank of Squadron Leader and in July 1944 he started a second tour, with 617 Squadron. He was the pilot who dropped the second ever Grand Slam, and was involved in the attacks on the Tirpitz and other big targets. He received a bar to his DFC for this second tour. He moved to the USA after the war, and died in 2010. According to his daughter, the tankard was one of his most prized possessions. After completing his tour with Cockshott, Liddell was posted to a training flight as an instructor, but within a week he was called back to fly in the crew being put together by Norman Barlow, which would transfer to 617 Squadron. He was, of course, a much more experienced gunner than his crewmate, Harvey Glinz, but it was the officer Glinz who was chosen to be the A Flight gunnery leader. Jack Liddell had still not reached his nineteenth birthday when he climbed into the rear turret of AJ-E in the early evening of 16 May 1943. On a night when many young aircrew died, he has the dubious distinction of being the youngest of all. Like his comrades, he was first buried by the Germans in Dusseldorf Cemetery, but now lies in the Commonwealth War Graves cemetery at Reichswald Forest. Footnote: All the crew of AJ-E came from 61 Squadron, but only Leslie Whillis and Alan Gillespie had previously flown with Norman Barlow. The rest had mainly flown with three other 61 Squadron pilots, Ian Woodward, William Dierkes and John Cockshott. All of these would survive the war, and if their crews had stayed with them their chances of survival would have been higher. Such was the sad lottery by which so many casualties were chosen. A couple of things; there are still a lot of mysteries about how that crew was put together, and looking at them, it really puts paid to the dimwitted refrain that the Second Wave was for the “less experienced” crews and other goofups, which doesn’t describe McCarthy (30 ops), Barlow (32), or Munro (at least 20), and even the two less experienced pilots, Rice and Byers, were good types – isn’t it Byers that Gibson personally got commissioned at the end of his 106 Squadron tour? There is a book here, isn’t there?